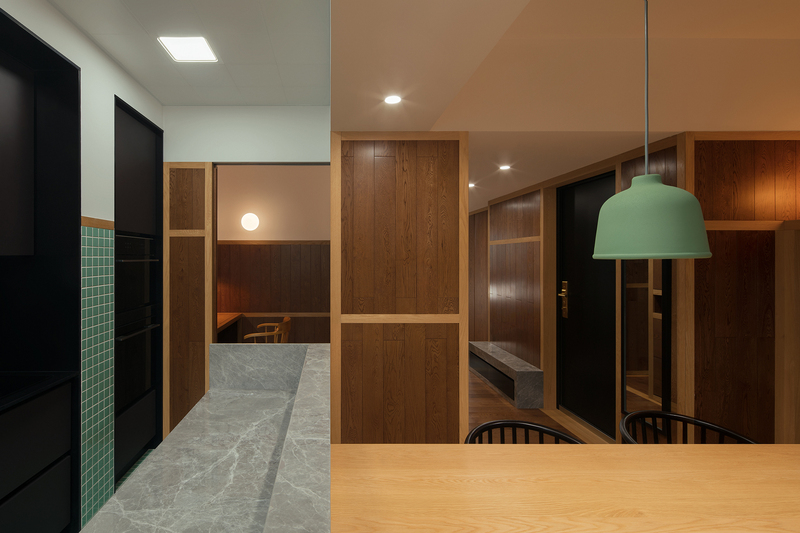 Designed by Drawing Architecture Studio (DAS) for a couple, Free Balcony An is an interior design that transforms a typical two-bedroom apartment at a commercial housing community in Beijing to a home both carrying the spirit of classical space and fulfilling the needs of modern life. The apartment is located in a slab-type building. Its façade is featured with Spanish style decoration. 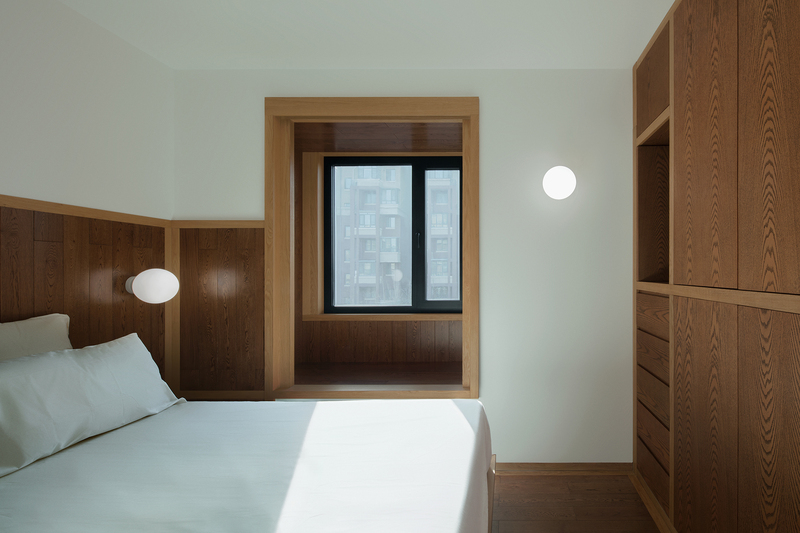 The apartment is north-south transparent with a ceiling height of 2.9m. All the interior walls can be removed. 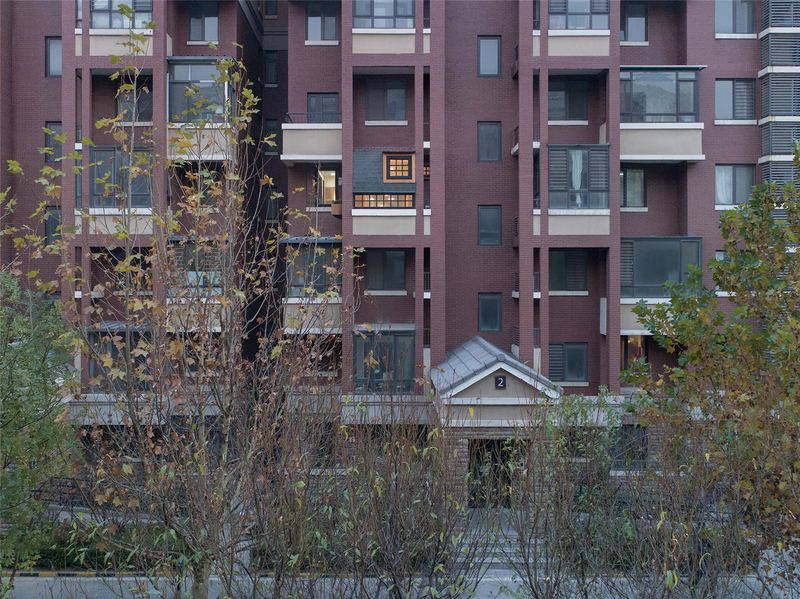 At the north end of the apartment, there is a small balcony given by the developer for free (according to the local regulation, the split-level balconies don’t count within the total area for sale). 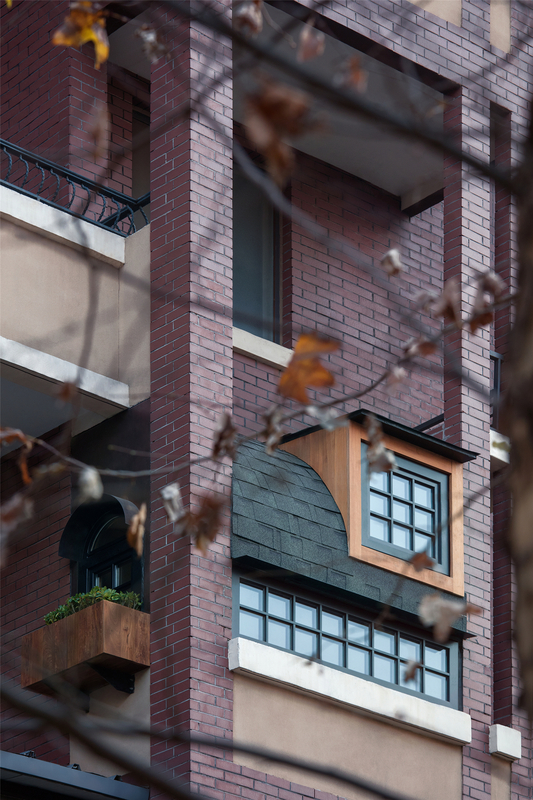 This free balcony became the most special feature of the project. 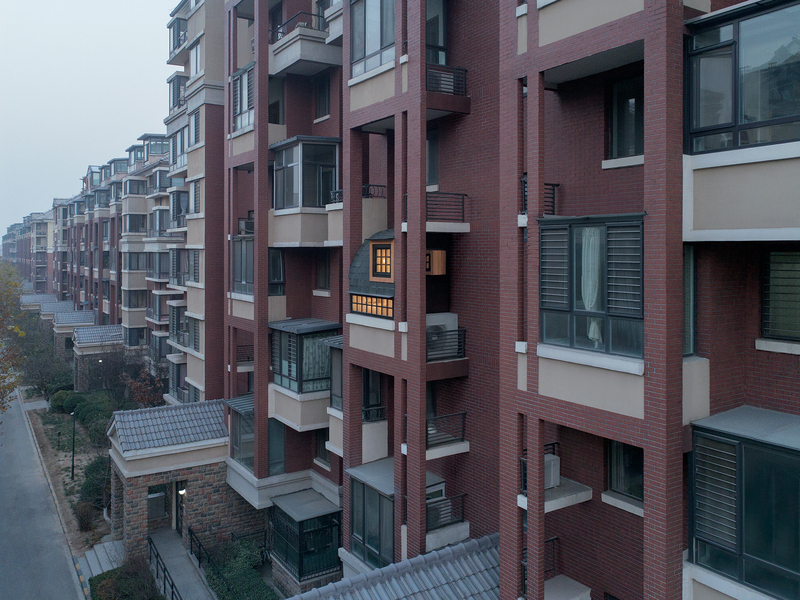 Because it was complimentary, the developer couldn’t close it when it was sold; because it is split-level, the balcony even didn’t have any roof. So, when the owner wants to close it, it is like building a small house. Thus, the original demand for interior design had a meaning of architectural design. The free balcony became the focus of this design and also inspired the name of the project. 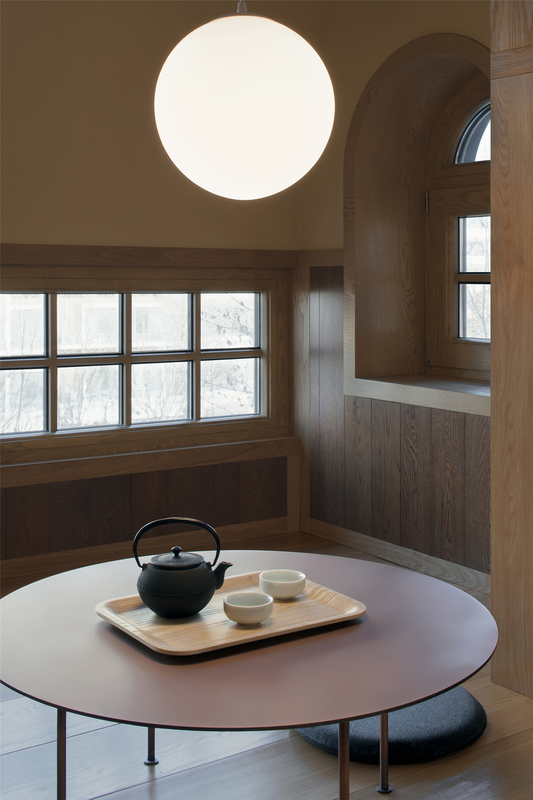 The design of Free Balcony An was influenced by Japanese architect Terunobu Fujimori’s Takasugi-an Tea House (a teahouse built too high). 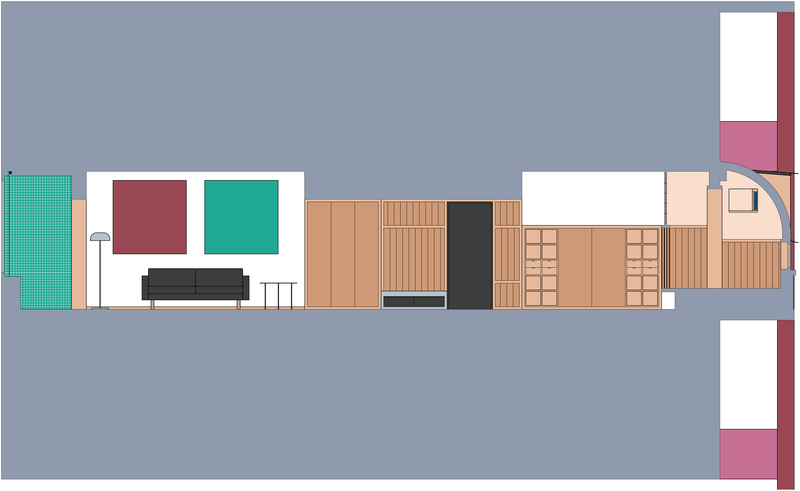 The client also likes Japanese culture and hoped to include a “tatami” on the balcony. 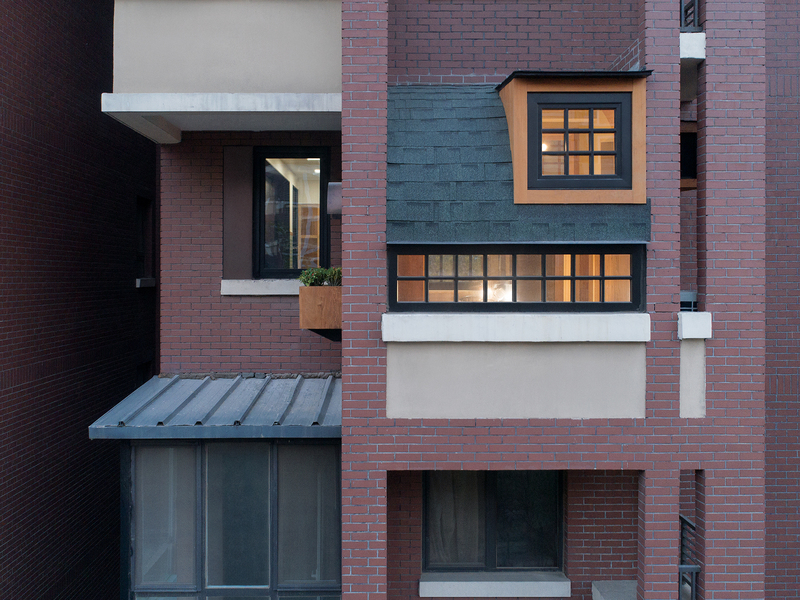 While Takasugi-an is a teahouse built in the countryside like a fairytale cottage out of this world, Free Balcony An is situated at a commercial housing district in the inner city of Beijing as an oasis for the urban home lovers. In his Five Points of Jomon Architecture, Tenorobu Fujimori made the sloping roof as the fifth one. He tried to use sloping roof to stand against the flat roof by Modernism. 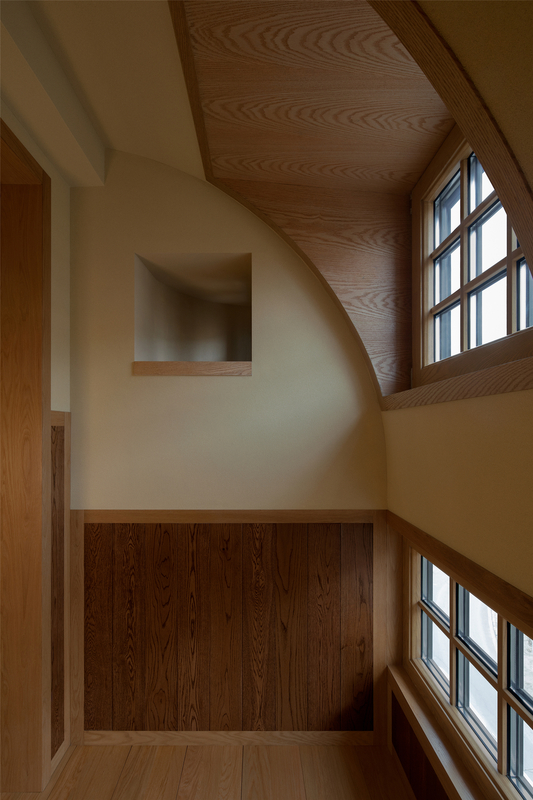 He argued that the sloping roof shall be as low as possible and it will encourage people to climb when looking upwards and to roll down when looking downwards, which stimulates one’s body and makes one feel the dynamism of the space. But a sloping roof will lose too much space. 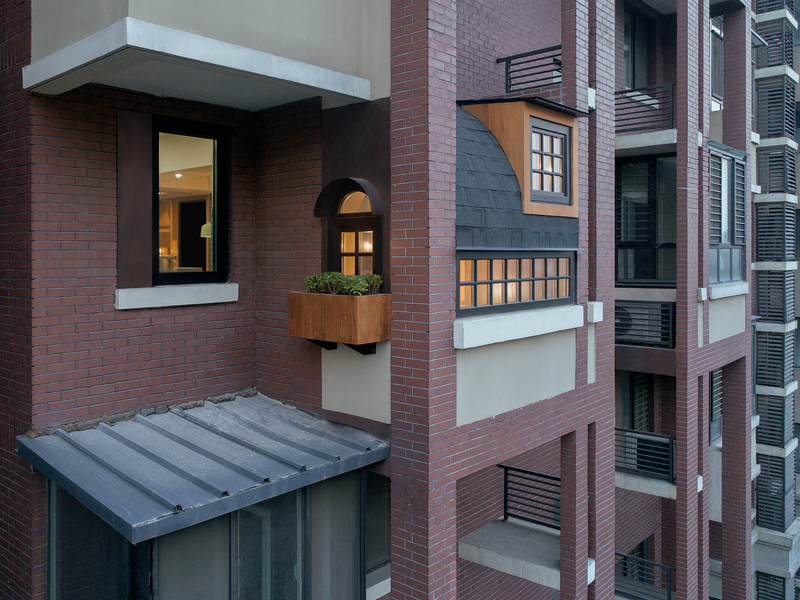 As a compromise, Free Balcony An adopts a curved roof with a roof window, which retains both the character of sloping roof and efficiency of space utilization. Following Fujimori’s instruction, DAS extended the curved roof of Free Balcony An downwards as much as possible and only left a narrow opening above the original breast board of the balcony as a horizontal window. 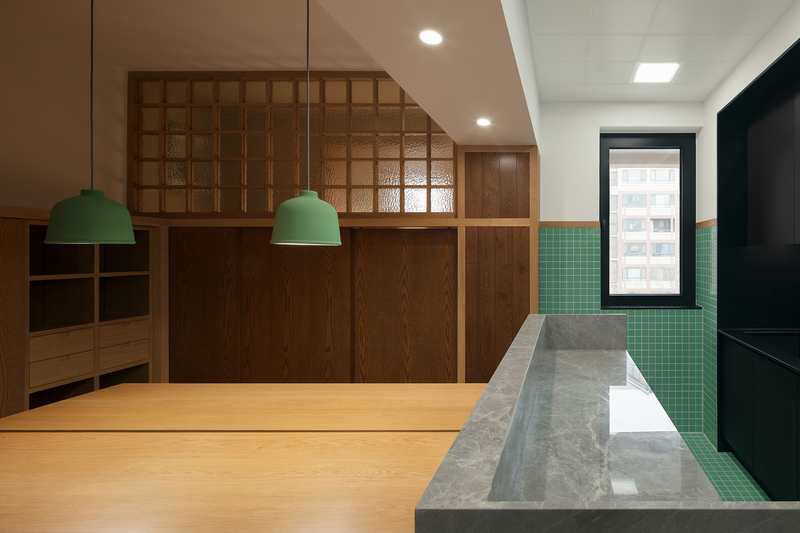 The subdivided lattices of the window create an illusion for the scale. The horizontal window becomes the façade of the An and the original breast board becomes its base. Close to the “ground” (the original balcony breast board), the curved roof suddenly feels huge as it is about 2 times taller than the “façade” (the horizontal window). The roof window seems like an attic hidden on the roof. As the sun sets in the dusk and the darkness hides its background, Free Balcony An is isolated from the surroundings and becomes a three-story big house. 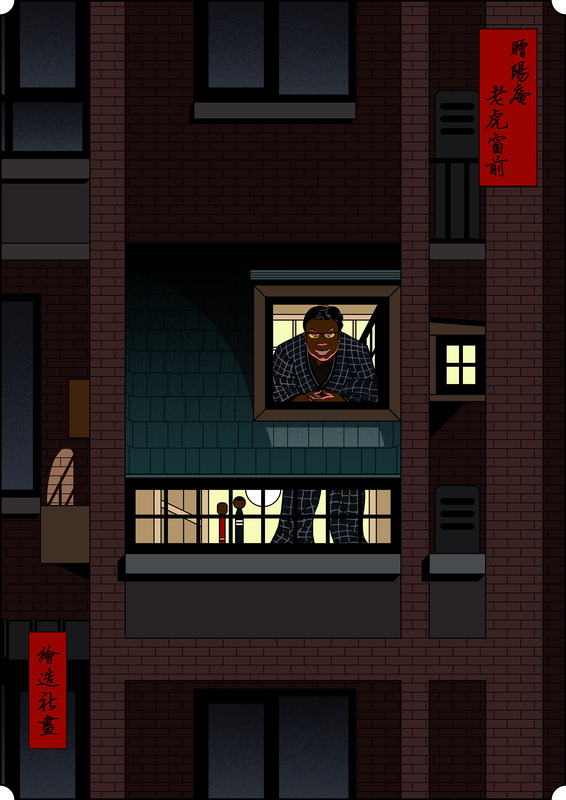 As standing in front of the roof window with head out of the attic, one would look like a giant statue of Buddha in the An. Such an association comes from the observation window on the upper part of the Great Buddha Hall of Todai-ji Temple in Nara. During certain days of celebration each year, the window will be opened so the visitors can see the face of the Buddha from outside of the hall. The huge observation window is like a small opening, while fly eaves and dougong make up a palanquin. Todai-ji Temple used to be the largest building of wooden structure in the world, but it makes the Budda like a bride in the palanquin. Free Balcony An is a tiny “house”, but it makes its owner a giant. In the world of art, returning to the classics is as same interesting as going to the future. In the design of Free Balcony An, DAS chose to return to the classics by the following means. 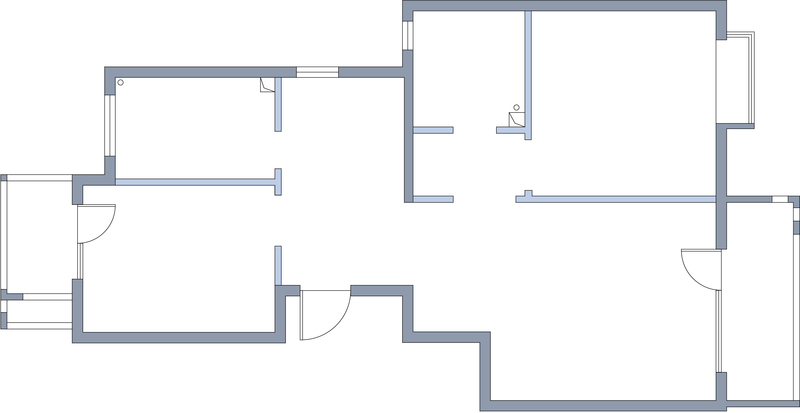 The original two-bedroom floor plan was designed for a home of three, which was very different from what the client needs for their life. 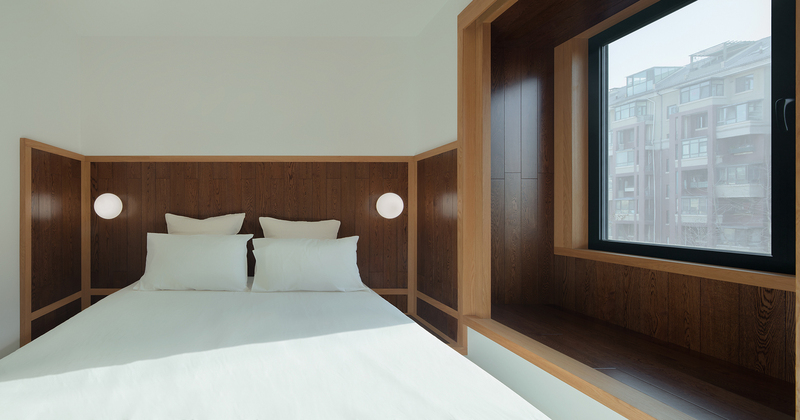 Since all the walls can be demolished, the interior is entirely conceived. The reason for taking down the walls is for enclosure. 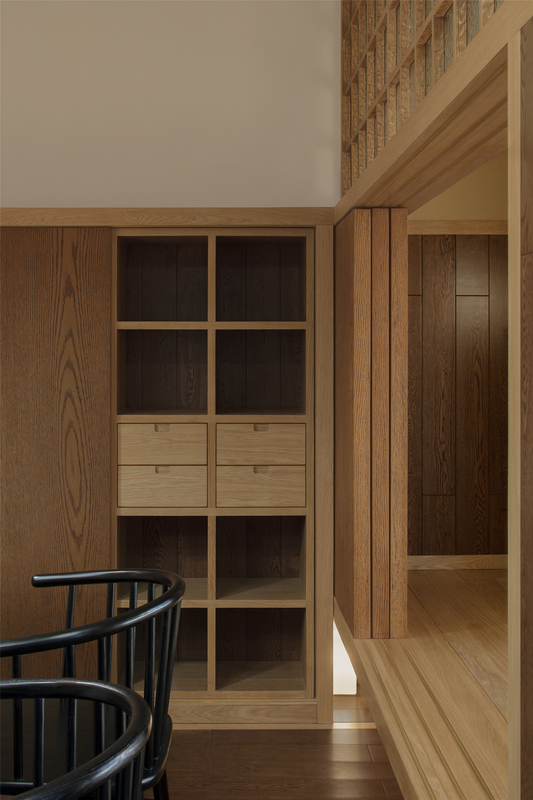 Instead of a popular open plan, the design aims to return to the classical small rooms which give a strong sense of enclosure. The original entrance is divided into entrance and study. The second bedroom is turned into tearoom and dining room. 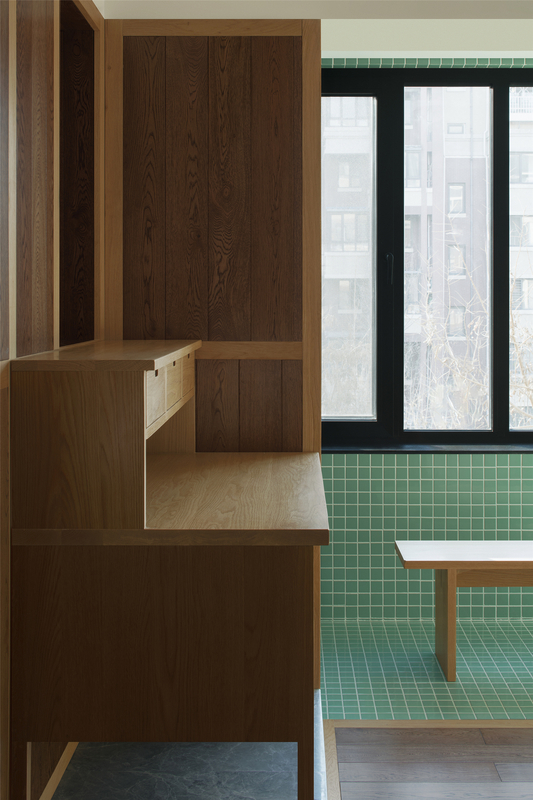 The washroom is separated into 3 independent parts - shower, toilet, and make-up room. 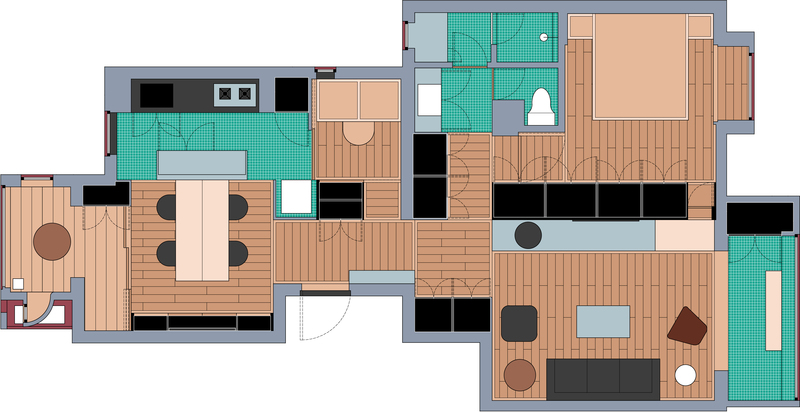 The new layout provides a rich spatial experience for this 90m2 apartment. When walking inside, one would feel going through one room after another rather than seeing everything at a glance. The division of the space creates some small enclosed rooms like shrine rooms often seen in the classical space. 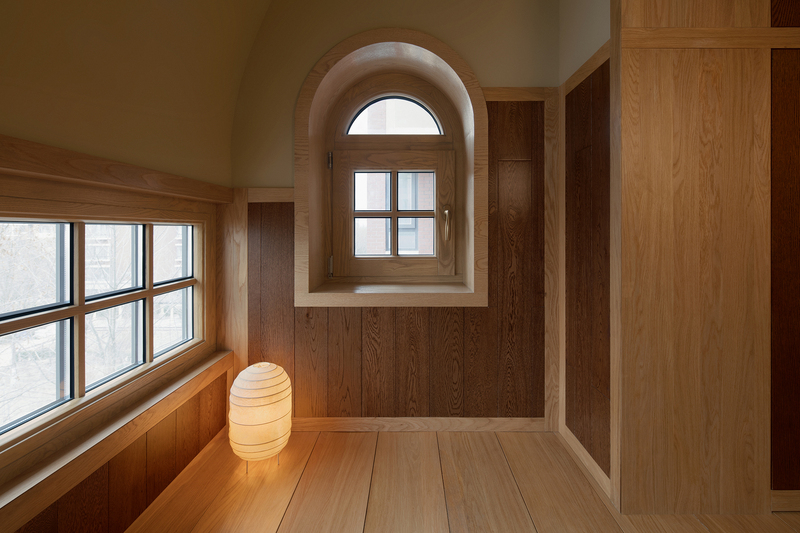 Today when everyone is connected to the world, such a small space might be even more precious in which one could feel one’s body close to the walls and gain some inner peace. The study is exactly such a shrine room. Besides being small, it is also dark in order to bring into the room the atmosphere of a Medieval monk’s chamber. The window is reduced to its minimum size and becomes a thin crack for light. 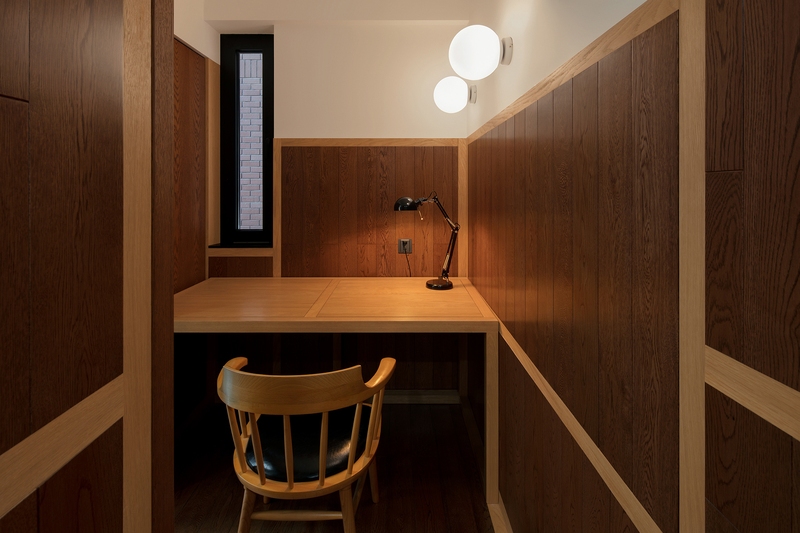 A streak of light, a table, a chair, and a bookshelf occupy the whole study. The tearoom is an oriental shrine room. 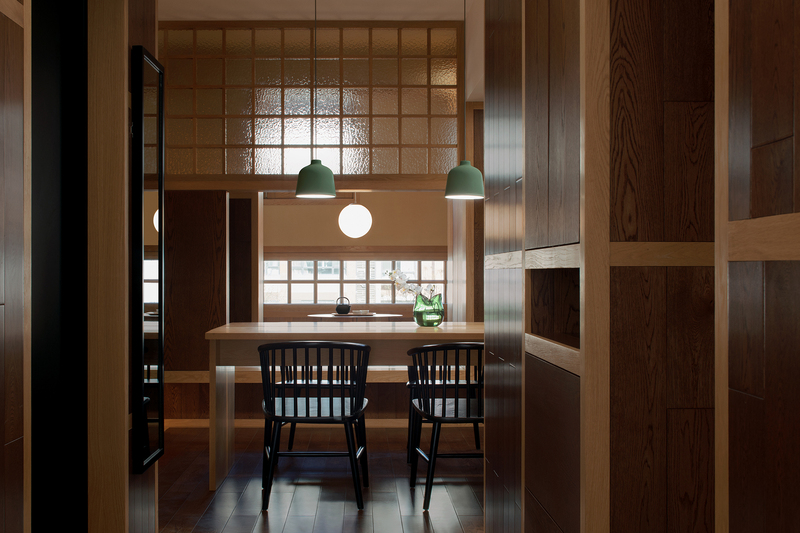 The evolution of Japanese tearoom is a process of minimization. 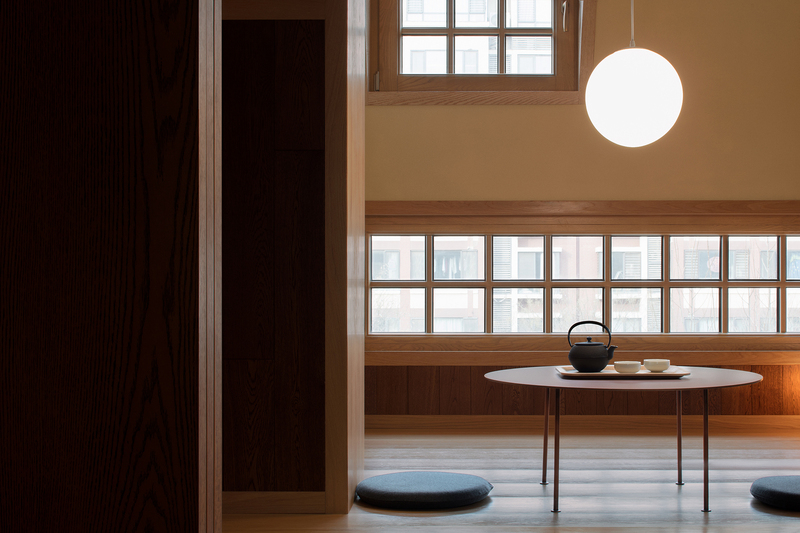 Sen no Rikyū ultimately set 2.5 tatami mats, or 4 m2, as the standard size for an ideal tearoom. 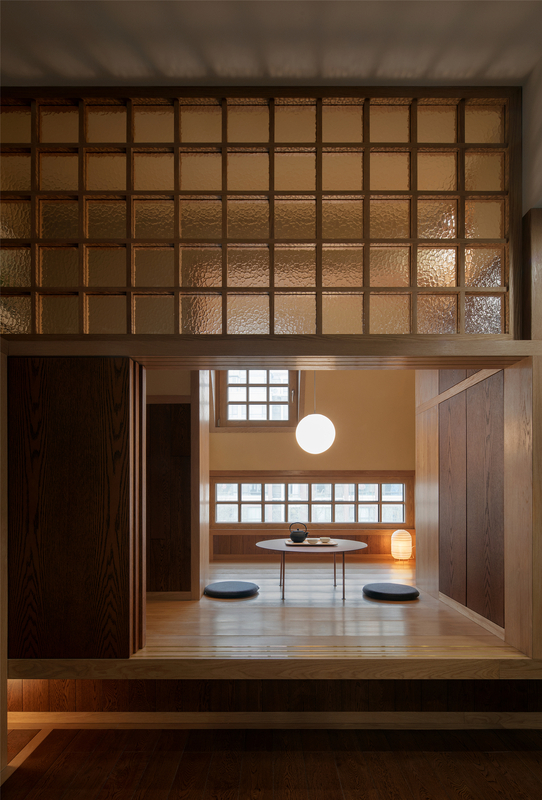 He also invented nijiriguchi, a kind of small entrance especially for tearoom. Everyone, regardless of samurais or civilians, must get down to their knees in order to get in, which exemplifies the spatial equality. In the case of Free Balcony An, the floor is raised up and the door beam is lowered so one is forced to crawl into the tearoom. 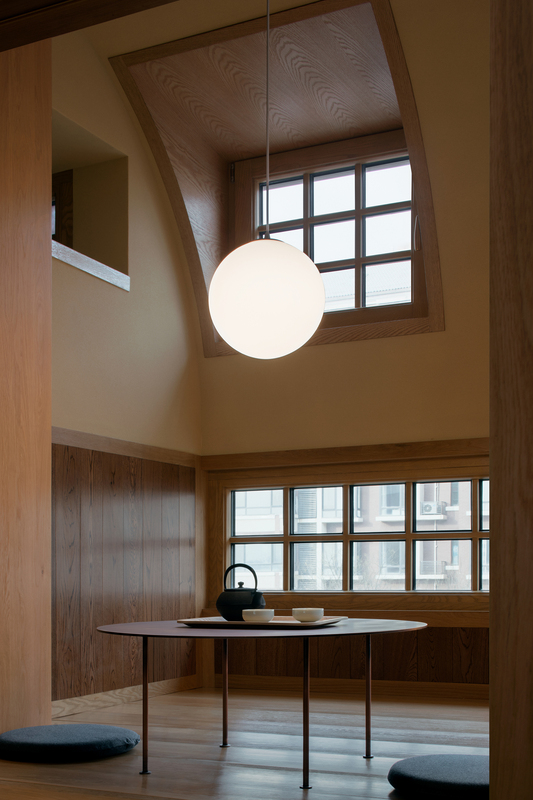 As sitting on the wooden floor and looking up to the curved ceiling covered with clay (diatom mud), it feels like being in a cave with four variously shaped windows as the openings of the cave, which is perfect for some contemplation over a cup of tea. The rich division of the space will not sacrifice the efficiency of space utilization, as what is used for division is not wall but cabinet. 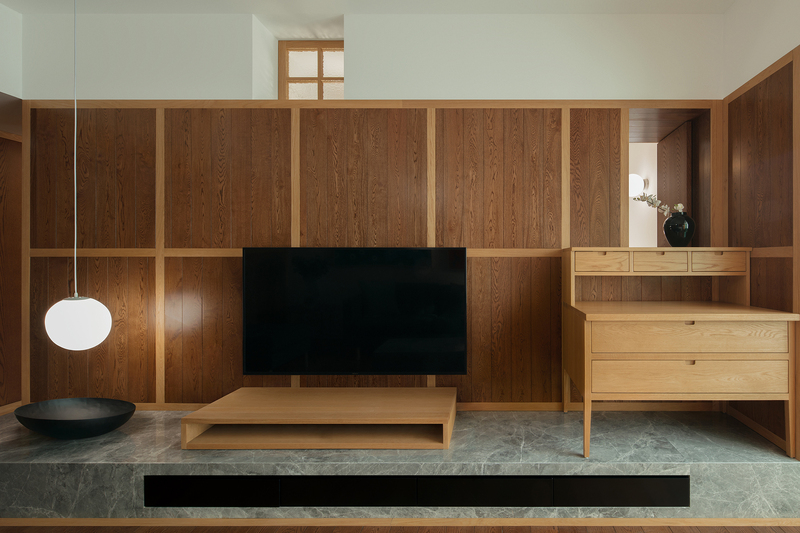 The partition between the bedroom and living room is for clothes and that between entrance and study is for books. 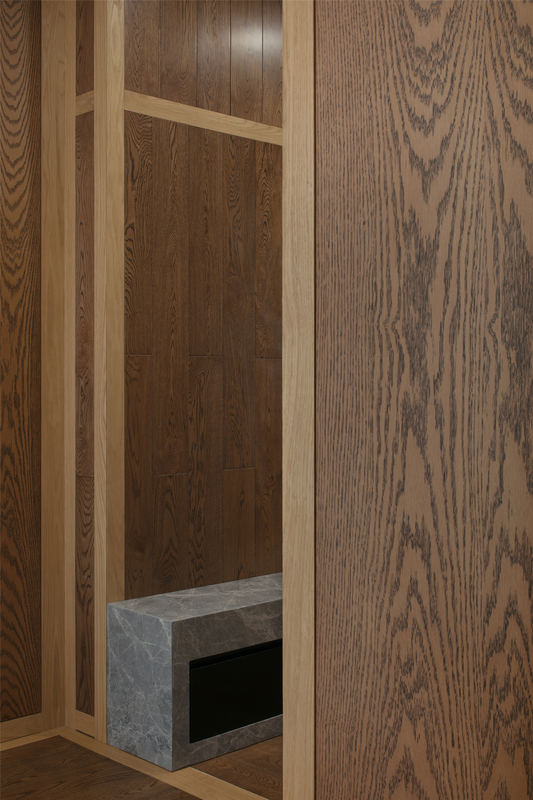 Making the storage as the wall does not only increase the efficiency but also create a thickness for the wall that can only be seen in classical architecture. The door is not a door anymore, but becomes a doorway. Such a design gives the space some quality of classical interiors, which fits the purpose of the room layout. The charm of the cinematography of Wes Anderson’s films lies in the symmetrical composition. Symmetry is one of the principles of classical design and generates a strong sense of ritual. 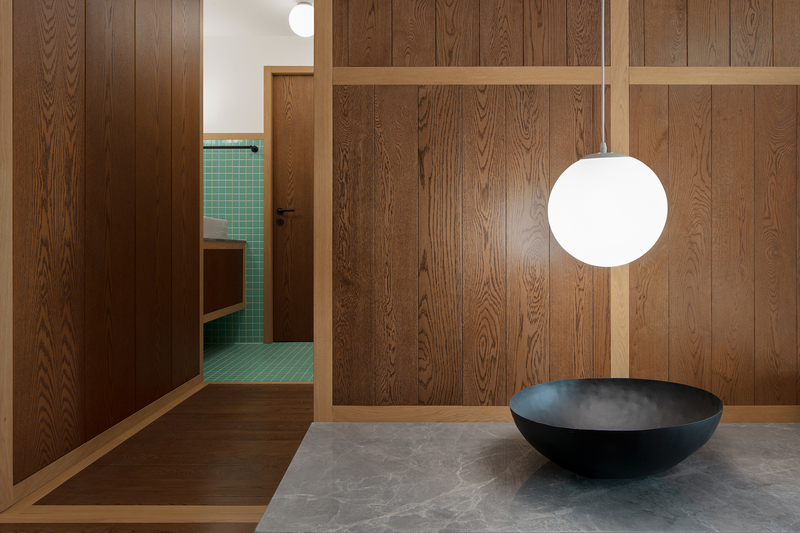 DAS hoped to bring some rituals into the ordinary daily life by creating some exceptional space for the client. 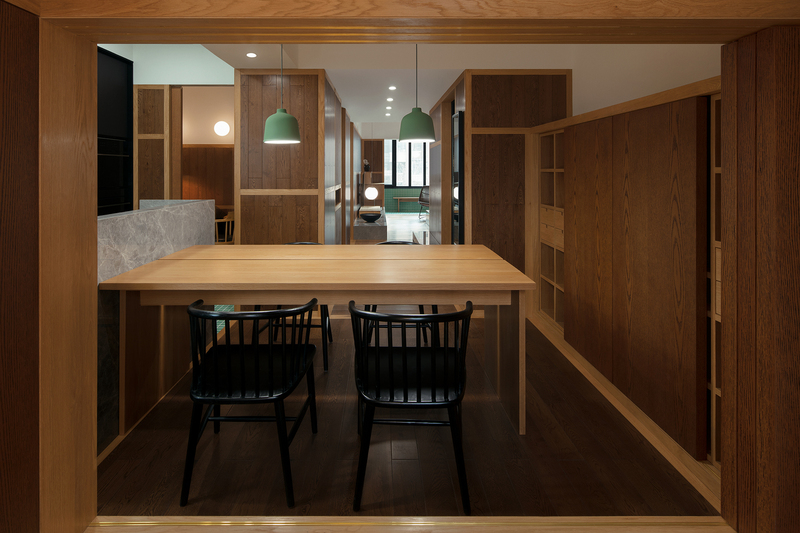 The kitchen cabinet, island, dining table, and sideboards form an axis. The strong symmetrical arrangement makes cooking and dining almost a sacred performance. The main balcony, stool, and balcony doorway are designed as another set of symmetry. 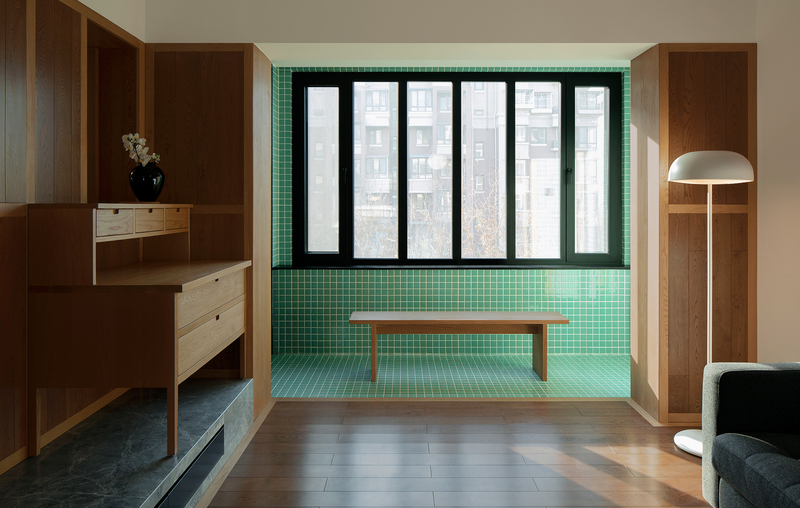 The big window is equally divided by an array of dense vertical lines with openings on the two ends, setting up a somehow solemn stage for daily activities like watering the plants or sitting in the sun. 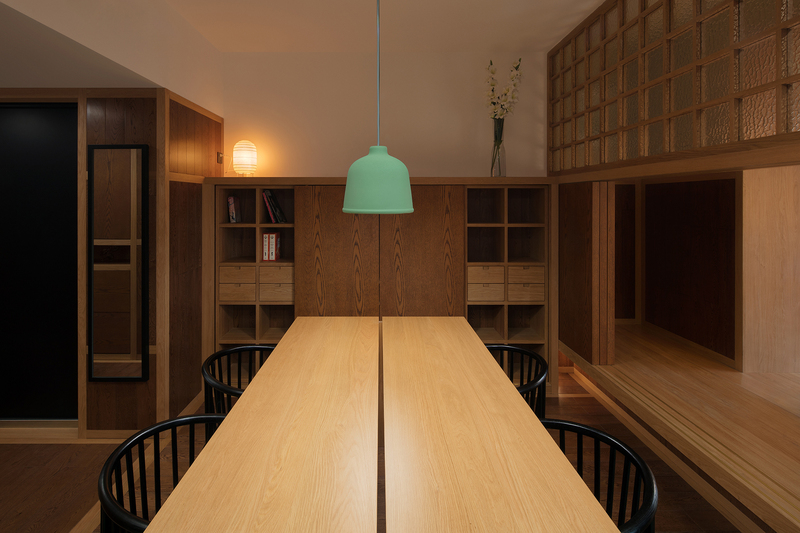 Adolf Loos claimed that decoration is crime. Based on today’s standards, his architecture is filled with decoration. However, they are not criminal, but rather charming. 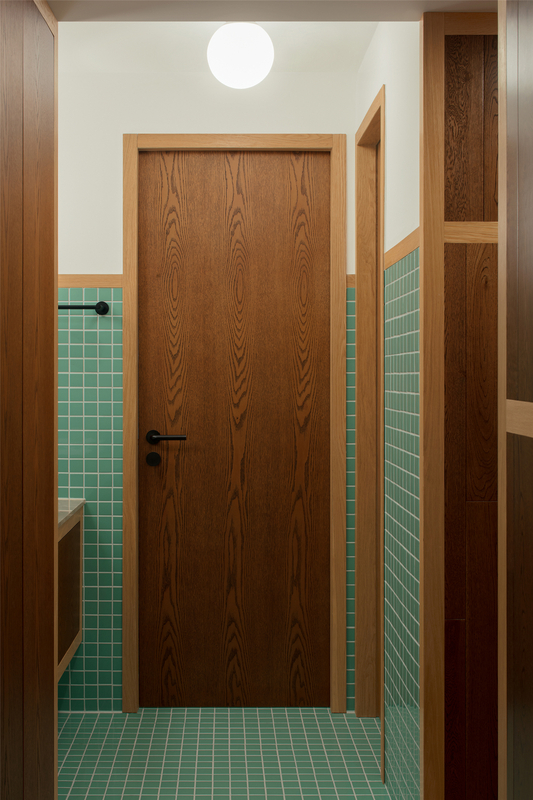 Loos used rich materials for decoration. The junctures of different materials are his moldings. 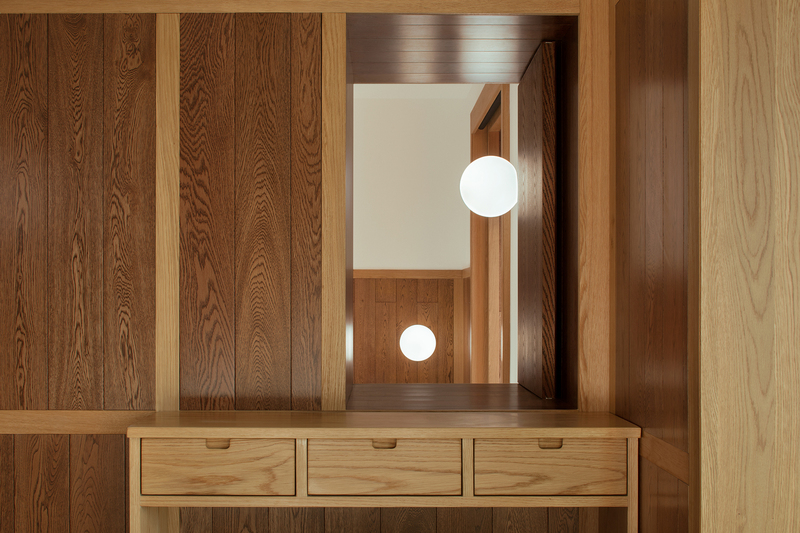 He integrated material, decoration, and space into one. 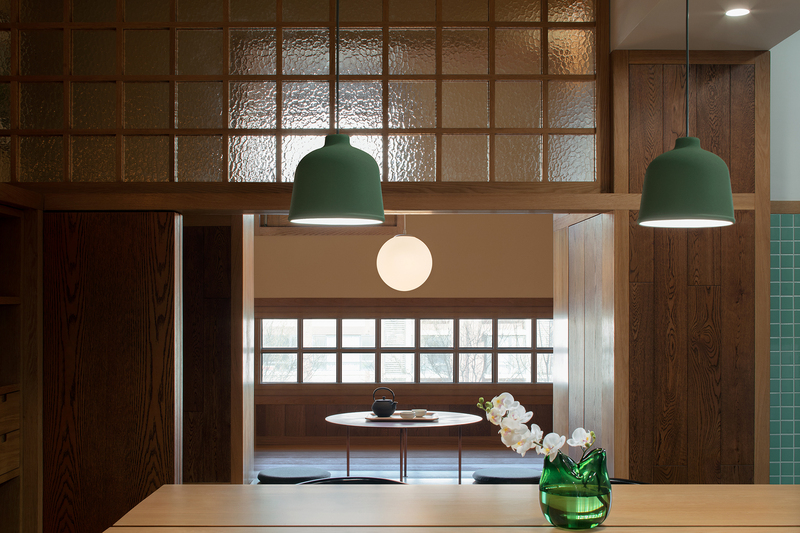 Decoration becomes material and space. DAS also used various materials in this case. 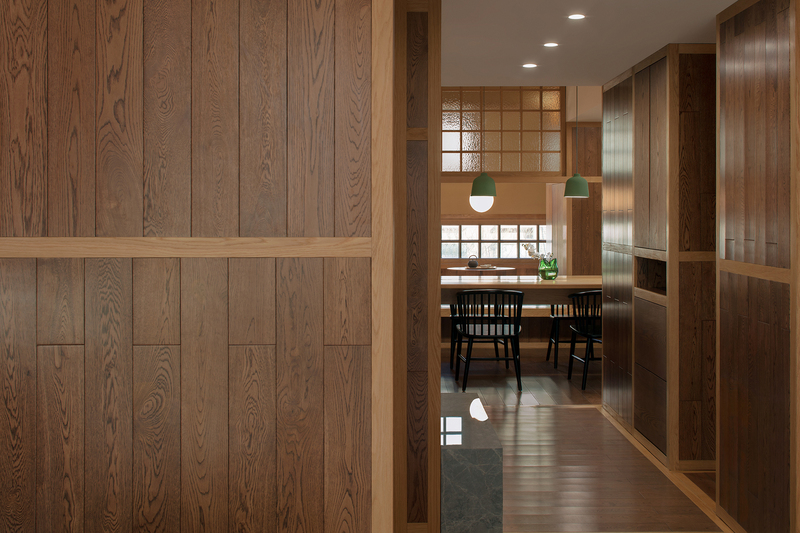 The wall and floor are covered with grids created by natural varnished oak stripes and chestnut-colored oak planks. 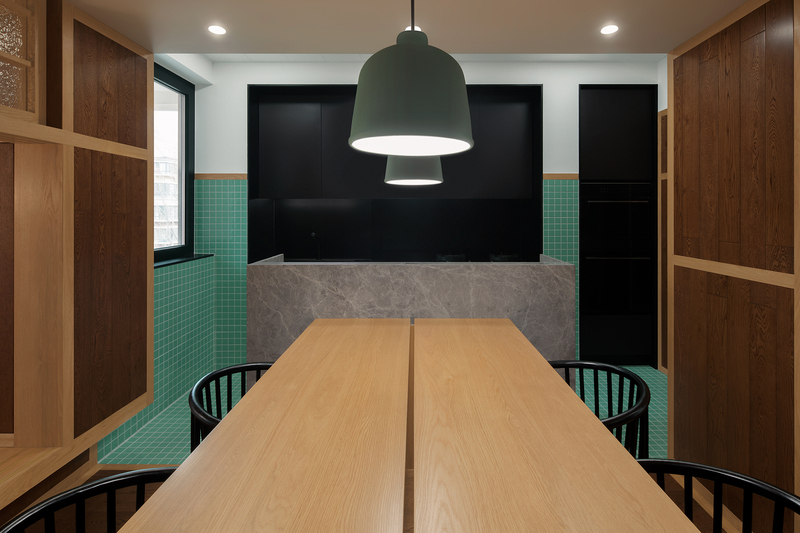 The furniture is made from black-painted boards, natural varnished oak, chestnut-colored oak veneer, grey marble, and red copper. Rippled glass is used for the window opening, making the shadow hazy and crushing. Green mosaic is for the wet areas. The wall of the tearoom is covered in diatom mud. The distribution of materials is neither based on the boundaries of the surfaces (wall and floor) nor on those of the spaces (rooms). Such divisions are too modern. 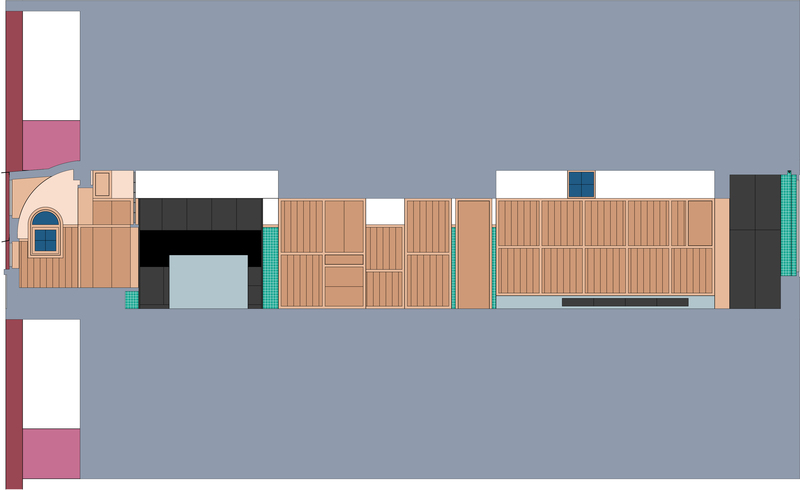 In DAS’ design, the material for the ceiling is extended to the wall and that for the wall is extended to the floor. Thus, classical elements like wainscots and chair rails have appeared. They are not merely decoration. 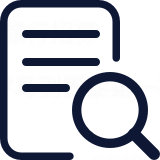 They have combined daily user experience. The accessible places are covered by solid and tactile materials, not only for functional purpose (easy to clean), but also for feel (touchable). Paintings on the wall have become dispensable decoration in contemporary architecture. However, they are very important in classical space. 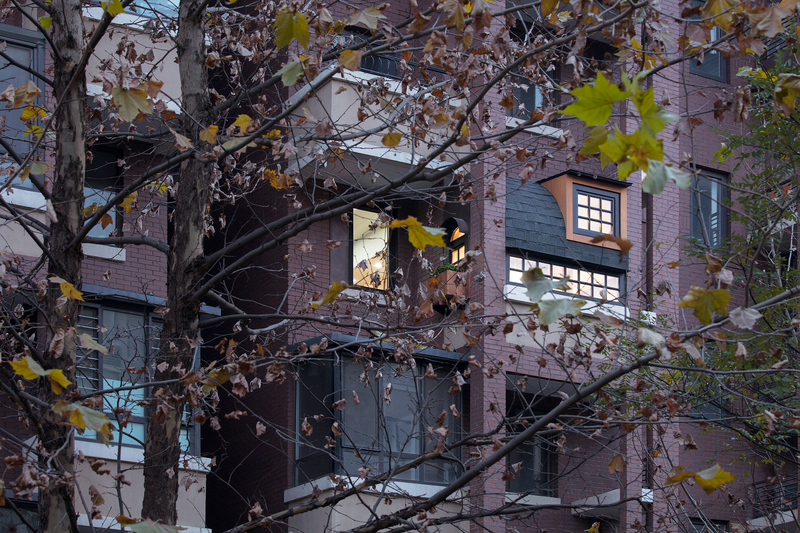 In the design of Free Balcony An, the tradition of using paintings is restored. They are no longer some independent existence, but become part of the space. They are understood as the material, color, and texture for part of the wall. 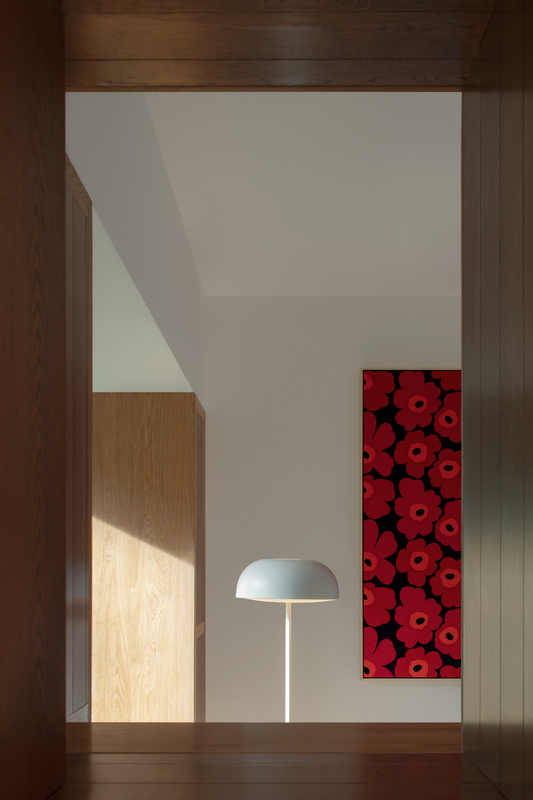 Some signature designs from the Finnish textile label Marimekko are framed as the paintings on the wall. In the movie Kamome Shokudō, it is said that geographically Finland is the closest European country to Japan with only 10 hours’ flight. 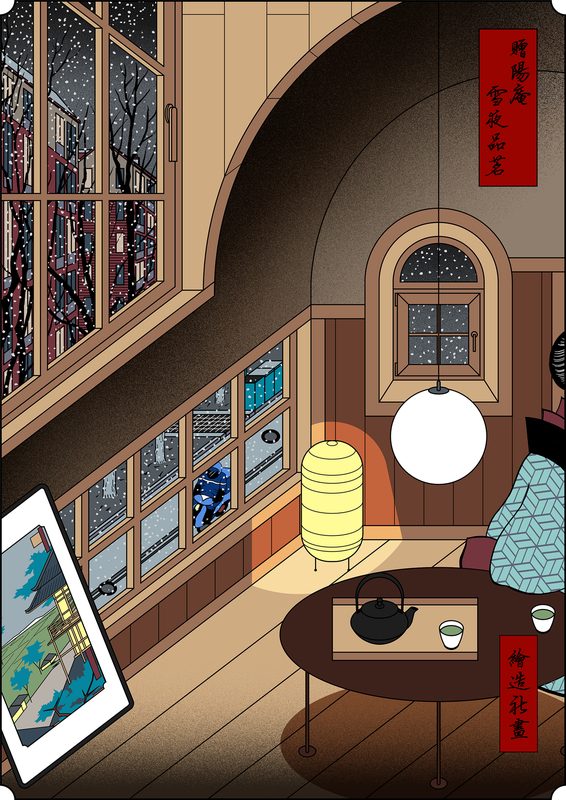 In terms of aesthetics, Finnish and Japanese are very similar, both simple and warm. The interior design of Free Balcony An starts from a Japanese tearoom and ends on the floral prints from Scandinavia, indicating the extreme richness and similarity of the global culture. In architecture, there are no strict boundaries between the past and future, the classics and modern, the local and exotic. 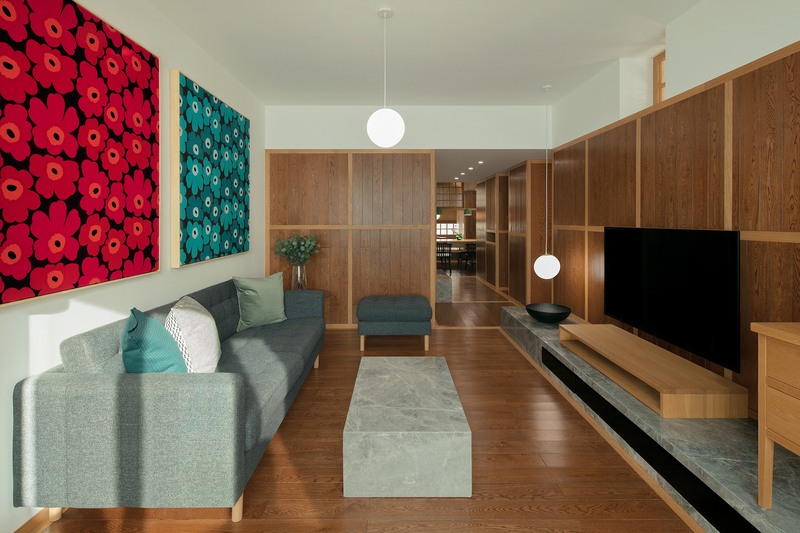 By referring to the classical space and traditional Japanese-style room, DAS hoped to explore the form of contemporary living space and to create a unique Beijing style for the local residential balcony. To DAS, returning to the classics is to approach the future; and depicting the exotic is to develop the local.